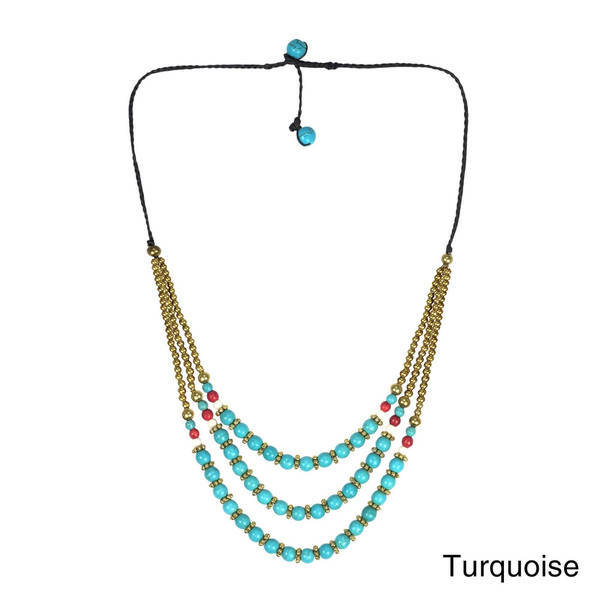 Artisan Tor orchestrates a combination of natural stones, creating an alluring cascade of colorful necklace. A versatile piece that is perfect for everyday wear. Tor was a young professional working in Bangkok, Thailand. He soon realized that his current job left him unfulfilled and he dreamed of starting his own business in something that was more rewarding. Tor describes his story in his own words. My name is Tor. I have a graduate degree in finance and worked for a private firm for several years. I began making jewelry as a hobby and soon realized that it was my true calling. I saved up as much money as I could until I had built up enough capital to open my own store. With hard work and patience, I now have a few employees whom I have taught my designs and they help me fulfill customer orders. I enjoy coming up with new designs and working with my customers to make beautiful and original jewelry. All weights and measurements are approximate and may vary slightly from the listed information. Treatment code CR (howlite) N (freshwater pearls) D (reconstructed turquoise). See Treatment Guide for further information. Blah!! Disappointing and not very pretty or wearable. It will be perfect to layer with a jade necklace I have or to wear alone.